Is society possible without accounting? In speech or in writing, we communicate actions, plans and decisions using numbers, calculations, words and images. Although accounting research is dominated by quantitative analyses, the role of accounting in society is firmly established over thousands of years. In this concise book, Lisa Jack demonstrates the power of social theory in expanding the value of accounting research. 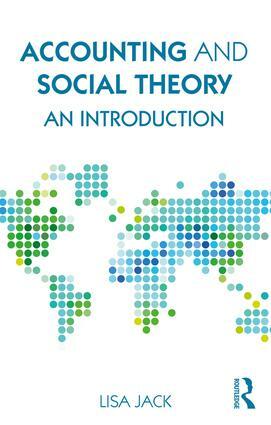 Accounting and Social Theory: An introduction includes advice on research problems as well as guidance on fertile areas for new research. The tools, techniques and developments covered by the author help readers to see social research in accounting as the study of the use, misuse and abuse of accounting communications by people and the effects that this has on social relationships. Stories of accounting in war, agriculture and food, gender, health and other areas illustrate the ways in which the threads of accounting run through society. Having emerged from the author’s wealth of teaching experience, this book provides a student-focused treasure trove that illuminates the field for early-career researchers in accounting and established academics looking to expand the impact of their work. 1. Why Use Social Theory to Study Accounting? Lisa Jack is Professor of Accounting at Portsmouth Business School, University of Portsmouth, UK. She has written several academic papers using social theory, and co-edited The Routledge Companion to Accounting Communication. She has a special interest in accounting in the agri-food industry.